In the recesses of the Balkan Mountains, between Tarnovo and Gabrovo, the medieval village of Bozhentsi is huddled up amongst age-old trees and fabulous legends, established more than 700 years ago. Amongst sparkling crystal air, bewitching quietness and impressive nature, amongst herbs and flowers, the unique white houses of Bozhentsi could be seen, covered with stone tiles and slabs and filled with the coziness and warmth, preserved by the generations of Bulgarians, that have been living here over the centuries. In the heart of the Balkan, Stefanina House is located, associated with one of the eldest families in Bozhentsi – the Parapanovi family. The house has fully preserved the Bozhentsi traditions, creating exclusive coziness and comfort to its guests. There are 5 (five) in number double rooms, by 10 (ten) guests, 4 (four) of them – with large King Size bedrooms, and the fifth one with 2 (two) single beds. The rooms are furnished with solid antique furniture of teak timber, which create unique atmosphere and sense of connection with the local traditions. Each room has available LCD TV set with digital satellite signal and well-heated converter radiators. Each room has available private bath and WC unit with shower-cab, infra-red hating and hairdryer. Each room is given its own name, reflecting its nature and place: the Room with the veranda, the Stone bedroom, the Room under the cherry-tree, the Bedroom under the walnut-tree, the Corner room, the Room with the hearth, the coaches and the kitchen. The house has available a reserve water source and in the event of stopping the water supply in the village,it automati- cally switches to self-water supply. On the ground level of the house, there is a sauna located in a beautiful stone room, which has available infrared emission, which is exclusively useful for human health, destroying viruses and bacteria, and it also could be used by people with cardio-vascular diseases, including by those with implanted bypass.On the first floor, the room with the fireplace is situated, with the coaches and the kitchen, which creates the sense of home coziness and warmth, providing opportunity to the guests to prepare themselves the dishes desired by them. The kitchen is supplied with refrigerator, furnace, microwave stove, ceramic hot-plate and grill, utensils washing machine, laundry-machine and drier. As extension of the room with the coaches, there is the yard with a typical hearth in the Bozhentsi style, with BBQ facility and furnace for roasting and baking, where the guests could spend pleasant days and evenings under nice old trees and the starry sky. You'll have a lot of unforgettable moments in this fairy environment! 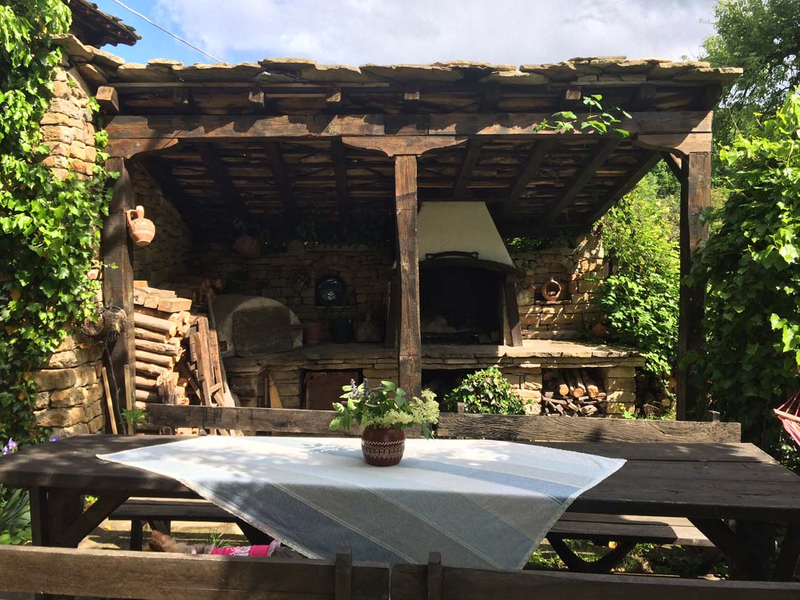 The barbecue is located in the yard of the house, next to large table for eating where our guests can enjoy the beautiful nature and home-cooked food. Near a barbecue has a furnace. In the furnace can be placed a large roasting pan with meat / lamb, pig /, the door of furnace is closed with a stone slab and sealed with clay so that after a few hours you can enjoy incredibly delicacy. Our guests are provided to make dry wood on fire and all necessary appliances and utensils - plates, cups, trays, forks, spoons, also a refrigerator, dishwasher and more. The cost of this additional service is 20 BGN per room. When the barbecue is used by a company occupying several rooms cost 20 BGN for all. n the place Uzana locate the near Ski Resort in this area / 25 km/ and there is Bulgarian geographical center when guests can enjoy beautiful nature and many small hostels and pubs. This is a nice architectural and historical reserve, with shops of handicrafts and artist galleries.There is a walking path starting from the village of Bozhentsi and passing through the mountain. Etara – ethnographic museum is located 17 km away from Bozhentsi – a settlement of crafts, with many workshops, where masters work with tools, driven by water wheels. НSome 2 km above Etara, high up In the mountain, there is a women’s monastery, which in the past gave shelter to many national heroes during the Liberation wars. Some 15 kilometers from Bozhentsi, at altitude of 1523m the historic mount Shipka is situated, a national park-museum with statuesque memorial complex, in honor of those who perished in the Russian-Turkish Liberation War. ROMAN ROAD - Ancient Roman road runs through the eastern part of the Bojenci. The road connects the largest discovered in northern BULGARIA Roman town NIKOPOLIS AD ISTRUM of Emperor TRAIAN with southern BULGARIA and CONSTANTINOPLE / ISTANBUL current / .The road passes through beautiful mountain locality of springs and wells, and have historical landmarks, shelters and labeled legendary places for tourists. In 3:00 hours from Bojenci walk to way to Gabrovo town in the mountain locate HOTALICH THRACIAN fortress and tourists can walking in historical places. MUSEUMS - From the administration center of the Bojenci can take guide which tell tourists about monastery school, church, candle works and authentic house-museums, preserved the medieval look and lifestyle of the founders of the village and tell them old stories and legends of colorful personalities who inhabited this paradise part of our country. Traditional Bulgarian restaurants /pubs/ in Bojenci- locate in original buildings 350 years old with antique equipment and furniture. In them everybody can enjoy the spirit of past age and try the specialties of local cuisine- bread, suchet, krokmach, sausages and home Boyar’s on wooden grill, real wood barbecue.